People often say that they eat way too much on the holidays. After all, there's nothing quite as grand as a Thanksgiving turkey dinner, wouldn't you say? Yum! But it's easy to get carried away, as in the case of this dinner that registered at a whopping 79,000 calories! Well, the good folks at Craig's recognize that over eating is an all too common holiday problem. After all, they too enjoy the elegantly spread festive tables as much as we all do; tables filled with turkey and ham, mashed potatoes and sweet yams, rich gravy and stuffing and cranberry sauce. And let's not forget the pumpkin pies and fresh whipped cream! Like you and me, they too have been known to over eat a time or two. 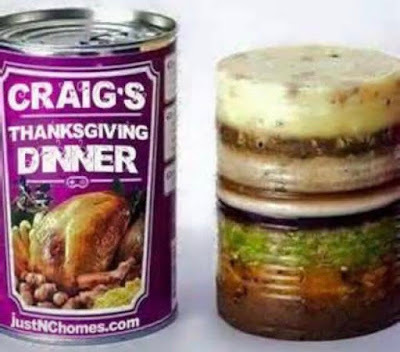 So to help us all slow down our calorie intake at holiday dinners, they proudly introduce their Thanksgiving dinner in a can. They're certain that, you not only won't be going back to the trough for seconds, you likely will lose your appetite well before even finishing your first serving. 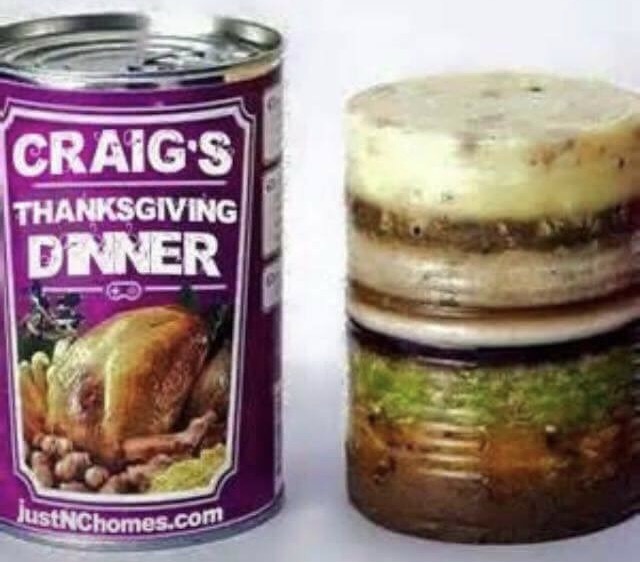 So go ahead and enjoy your festive family gatherings, and leave it to Craig's to help control the excessive eating and calorie intake. I've always thought that my homemade chili was already pretty awesome; basically a 50-50 mix of ground beef and ground pork, kidney beans, onions, bell peppers, jalapeno and habanero peppers, and various spices. And then I saw a video from BBQ Pit Boys where they made a chili with venison loin chunks. It inspired me to try a variant of my already classic recipe. I didn't have any venison, but I did have plenty of lean pork loin. Maybe a substitute was in order. 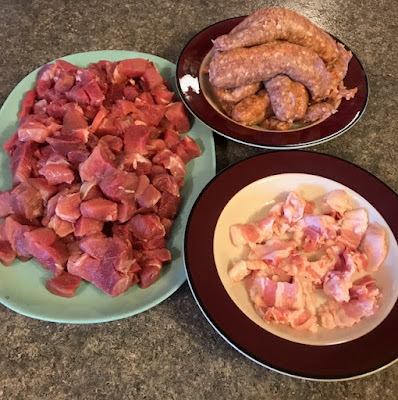 The meat for the chili consisted of three pork loins (about 4-5 pounds) cut into chunks, eight beer flavoured bratwurst sausages (casings removed), and about half a pound of bacon. These were lightly cooked in the pot first with some Canola cooking oil. Conspicuously absent was the traditional chili mainstay; ground beef. The fresh veggies that found their way into the chili were: three kinds of sweet peppers, several jalapeno peppers, several mushrooms, and a couple of whole onions. The spices consisted of: 1/4 chopped whole garlic, 2 tsp black peppercorn, 1 tsp salt (I cut the original recipe's salt in half), 1/2 tsp cumin, 3 tbsp chili powder, 1 tsp cayenne pepper (twice the original recipe), and 1 tsp oregano. Then came the kidney beans; a chili mainstay. After everything was added to the pot, I added about a litre of beef stock to bring the liquid level to just below the chili level, and then to the whole concoction, I added a can of beer. A few years ago we gave up on our old propane barbecue and returned to good the old-fashioned charcoal barbecue of yesteryear. That decision has brought no regrets; the flavour difference of the food cooked over charcoal versus propane is incredibly noticeable. 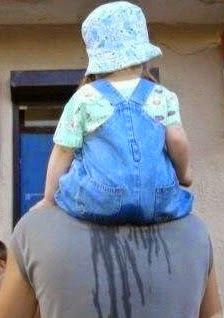 The only question is, why did we ever jump on the propane bandwagon in the first place? I'll never go back to propane/gas barbecues! Charcoal is so much better, in my humble opinion. So here it is, our little charcoal grill preheating in anticipation of the chili that would soon find its way onto her grill. Would you look at that? It almost looks good enough to eat already! But we need to still let it boil down a bit, stirring occasionally, before delving into this foodie utopian ecstasy experiment. A little boiling over was no big deal, since we were on an outdoor grill and not a kitchen stove. Still, this begs the question: Which is better; outdoor charcoal grill chili, or inside stove top chili? I would soon have the answer to that important question. 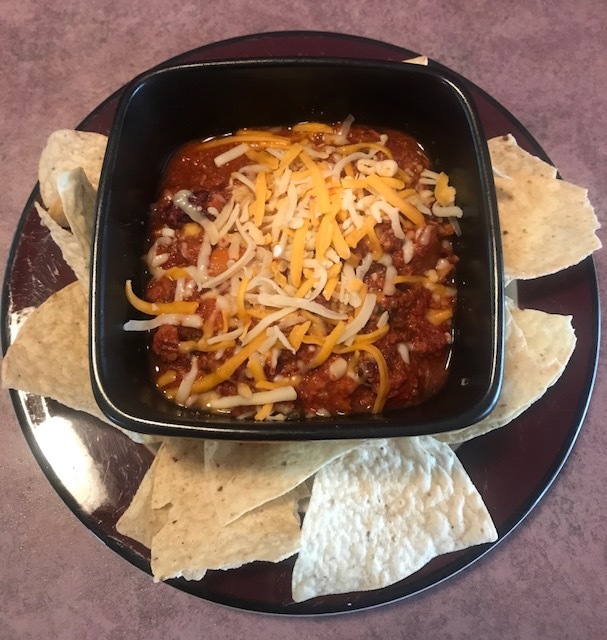 Like other dishes I've experimented with, I'd soon discover that chili too, is better on an outside grill than an indoor stove top. Verdict is in; there is no comparison! However, before this masterpiece would be complete, we needed still to add the awesomeness of some smoke. 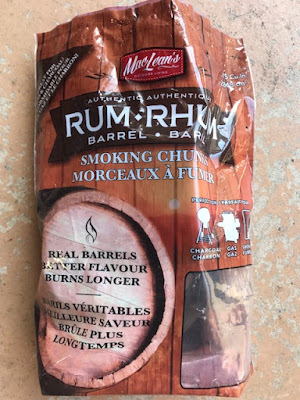 For that, I pre-soaked some chunks of rum barrel wood in water for about half an hour, and then added them directly on top of the charcoal. 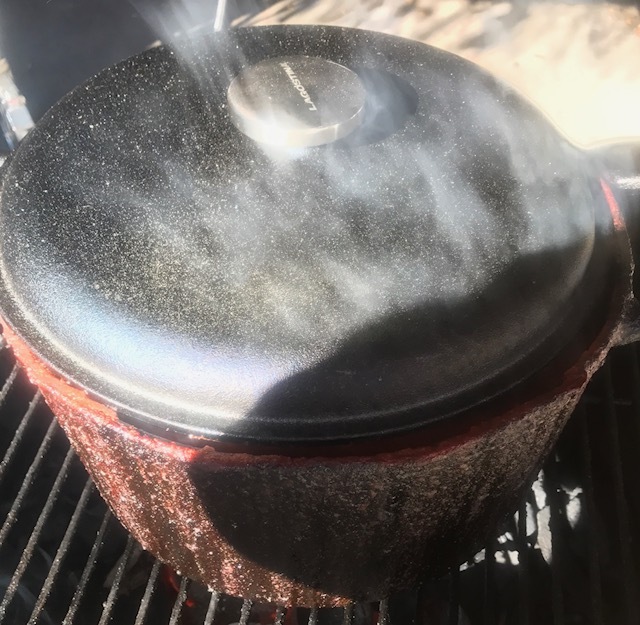 Since I love to use my Bradley Smoker regularly for other dishes, the addition of smoke here seemed quite natural. I wasn't disappointed! And finally it was time to remove the masterpiece from the grill and to chow down. Dishes were served with white corn chips on the side (see first picture) and some grated habanero cheese was generously sprinkled on top. Well there you have it; my already perfect homemade chili, gets the perfect facelift. Chili will never be the same again. Do you enjoy a good bowl of chili? 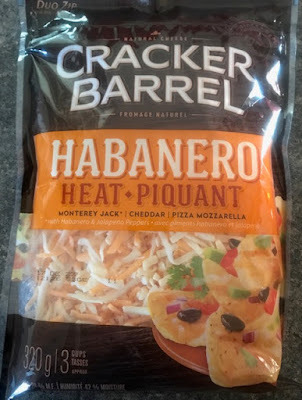 Well then it may be time to take this foodie classic to the next level and say goodbye to the pseudo-chili of yesteryear. Lesson: Step out of your foodie comfort zone and experiment; you may be pleasantly surprised at what ends up on the dinner dish. Happy eating. Peace.